More than 20 years later and that handprint is still on the car from Titanic. Director James Cameron's epic, which tells the story of the most infamous sinking ship disaster in history from the vantage point of a fictionalized love story, was released in 1997 and remains one of the most successful movies ever made by pretty much every measure. Speaking of that love story, one of the most iconic moments from the tale of Jack and Rose remains intact. This was revealed by James Cameron on Twitter recently. The filmmaker has been promoting his latest producorial effort, Alita: Battle Angel and decided to take us all down memory lane. Taking to Twitter, Cameron revealed a picture of the car from Titanic, in which, Jack (Leonardo DiCaprio) and Rose (Kate Winslet) made steamy, passionate love. At one point during that scene, Rose puts her hand on the steamed up car window and, per this image, the handprint is, miraculously, still there. Cameron provided the following caption with the image. "Over 20 years later, the infamous Titanic handprint is still there, look closely." While it's amazing to see the handprint, this isn't some bizarre miracle. Last year during AMC's Visionaries: James Cameron's Story of Science Fiction series, the filmmaker revealed that the handprint we see on the car window now, preserved quite well, is actually his own. A special spray was used to make sure steam, or time, wouldn't scrub it away from the history books. Still, seeing it all these years later is, if nothing else, worthy of some nostalgia. But there's more going on this photo than some may realize. James Cameron tells us to "look closely." Is this just about the handprint? Looking a bit more studiously, we see off to the right and in the center of the photo is the torso of the T-800 from the Terminator caught in the reflection of the car. Not coincidentally, Cameron is currently producing Terminator 6, which is being directed by Tim Miller (Deadpool) and is set to arrive in theaters this November. For his part, Cameron has been very busy directing Avatar 2 and the other planned sequels in what will ultimately be a five-movie franchise, assuming all goes well. 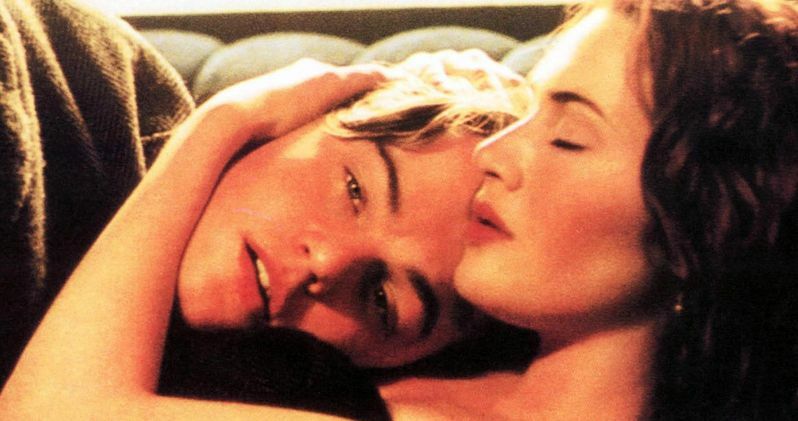 Titanic was a true moment in pop culture when it was released. The movie was met with heaps of critical praise and went on to gross more than $2 billion at the global box office, becoming the first movie to ever accomplish such a feat. Amazingly, only three other movies have done so in the years since, including Avatar, Star Wars: The Force Awakens and Avengers: Infinity War. The movie also swept the Academy Awards, taking home a record-tying eleven Oscars, including Best Picture. Be sure to check out the image from James Cameron's Twitter account below.